Try this dish with Better Than Bouillon Premium or Reduced Sodium Seasoned Vegetable Base. 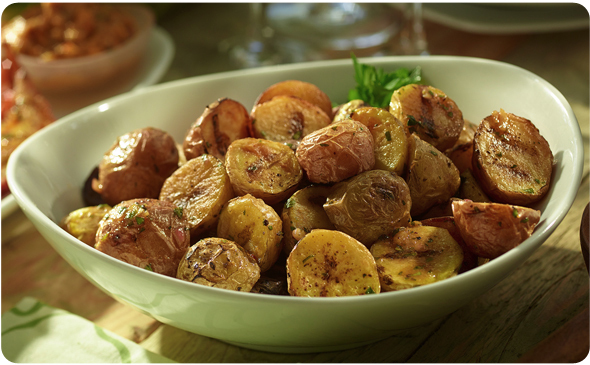 Toss the potatoes and vegetable oil in a large bowl. Add the potatoes directly to the grill. Grill for 10 - 15 minutes, turning occasionally. Remove the potatoes when they are tender and easily pierced with a fork. Add the Seasoned Vegetable Base, mustard, vinegar, parsley, onion, garlic, and pepper to a medium sized mixing bowl. Slowly whisk in the olive oil. Remove the potatoes from the grill and slice each potato in half, crosswise. Add the potatoes to dressing and toss to coat.